Otherwise known as the Irish wolf dog or war dog, this is truly a breed of old. Believed to date as far back as 7,000 BC (when huge, shaggy-coated dogs were first referenced in Ireland), the Irish Wolfhound paints a colourful picture of life many thousands of years ago when large dogs were favoured over small, lap dog varieties. There are many indications as to the Wolfhound’s ancient origins, including wood cuts and literature that specifically describe big bodied, long-legged dogs with a rustic, working appearance. The Wolfhound is also mentioned in old Irish laws and stories, which reflect how highly the dog was valued. 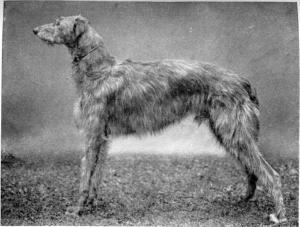 Many early writings liken the Wolfhound to the Greyhound in appearance and ability, although the former was often chosen for its strength and physical fearsomeness. It is no surprise that the Wolfhound was a popular choice in war, as its imposing size could easily unsettle an enemy. Many armies used this to their advantage and relied on their dogs following them into battle. In 391 CE, the dog was mentioned in a letter written by the Roman consul Quintus Aurelius Symmachus to his brother, who had been gifted 7 Wolfhounds to use for fighting lions and bears. There are also accounts of the Celts using these dogs in battle around 279 BC. Not only were the dogs strong and fearless, they were also easy to train and handle. Wolfhounds would often be left to guard the children and homestead while the adults were away, protecting against thieves and predators. Today, the Wolfhound is well known for its gentleness with children – a quality that is likely to have evolved over many years of guardianship. Owners describe the breed as a ‘gentle giant’ that is devoted to its family and always eager to please. Before the 19th century, Wolfhounds were primarily bred for hunting wolves and guarding livestock. References to the breed detail its great size, strength (to equal the Bulldog or Mastiff) and peaceful disposition. During the English Conquest of Ireland, restrictions were placed on who could own a Wolfhound, a privilege that was largely reserved for the nobility. From the 5th century, there are records indicating the profitability of breeding these dogs and, in fact, a century later, the price of a Wolfhound was believed to equal that of a prize stallion! So coveted were these dogs that they were often gifted to important foreign visitors or royals. Besides being popular in Ireland, Wolfhounds were also in huge demand overseas, with many royal European households importing them. Unsurprisingly, it wasn't long before breed numbers drastically declined in Ireland, leaving breeding stock depleted and posing the very real threat of extinction. In response to this mass foreign interest in the Irish Wolfhound, in 1652, Oliver Cromwell himself issued a declaration to ensure that a sufficient number remained in the country. In the 1880's, Captain George Augustus Graham took charge of the Wolfhound's survival and began outcrossing with breeds such as the Scottish Deerhound, Borzoi and Great Dane in an attempt to preserve the Wolfhound. It is this combination of genes that makes up the dog we know today. Sometimes referred to unofficially as the national dog of Ireland, because the Wolfhound was adopted by the British nobles during much of their rule, many Irish were reluctant to fully embrace the Wolfhound as their national symbol. Instead, the Kerry Blue Terrier was originally chosen for this role. That said, today the Wolfhound appears much more frequently and is even mascot to the Royal Irish Regiment. - The dogs' primary duty in battle was to jump up and drag the enemy off horseback or chariots. - The Borzoi is believed by many to descend from early Wolfhounds imported to Russia. - Irish Wolfhounds can reach a height of 7ft when standing on their hind legs! When on all fours, their size is comparable to that of a small pony.